The Positive Day - Page 14 of 15 - It's Not All Bad News! One step closer to commercial spaceflight! Today we received confirmation that the basic design of the spaceship is solid. 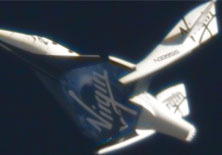 Reaching a “really major milestone for the test flight program”, Virgin Galatic’s commercial spaceship, SpaceShipTwo, completed its first feathered flight from 51,500 feet above Mojave, CA. For decades reentry into the atmosphere has been one of the biggest challenges of spaceflight, that’s been one of the more dangerous parts of spaceflight. And the big innovation that Scaled [Composites] and Burt Rutan came up with was this idea to feather the aircraft into the atmosphere so that the pilot could literally take his hands off the controls and it would stably enter because of the aerodynamic forces on the vehicle. Some more information about the science and inspiration behind “feathered” flight can be found at Think Like A Scientist. Kevin Olusola performs his beautiful and inspired arrangement for cello and beatbox of Mark Summer’s Julie-O. I’m a man searching for something within music. What brings out the such dimensions of feeling when music is played? Kevin is graduating from Yale next week and is then heading to Boston to study at Berklee College of Music. Ron Gutman highlights some research into the study of smiling. … lots of smiling can actually make you healthier. Smiling can help reduce the level of stress-enhancing hormones like cortisol, adrenaline and dopamine, increase the level of mood-enhancing hormones like endorphin and reduce overall blood pressure.